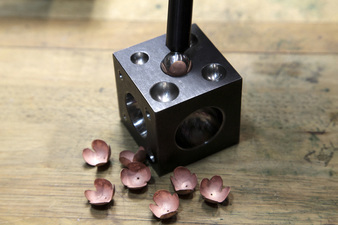 Making beautiful things is my goal; thus my pieces will have an intrinsic value for their workmanship and appearance. My first foray into enameling was at age twelve, in a high school art class and it did not leave a lasting impression. 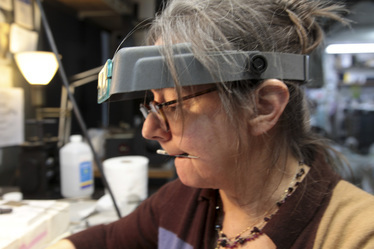 However, when I started attending jewelry classes in Manhatten twenty years ago at the Jewelry Arts Institute, I discovered the versatility and durability of enameled objects, many of which have survived hundreds of years. By background is in making pieces with a classic look and I have evolved with a simpler geometric floral design based on plants in my garden. I hope you like my creations. My Flower motif, which recurs in my work, whether earrings or necklaces is inspired my favorite flower, the Hydrangea. the right by Clicking on the image.